Like Santa Claus and dubious liquor ads, as sure as eggnog the holidays bring an array of British royals in noteworthy chapeaux. Only you can decide whether it's more gift, or coal. 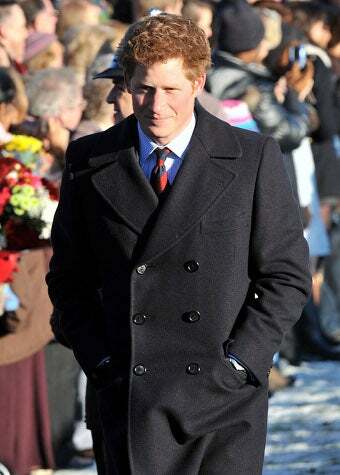 Not only does Prince Harry rock a topcoat but you know his never, ever has lint on it and he never needs to mess around with one of those crummy sticky rollers or a strip of masking tape because he probably has a valet who uses some ancient set of brushes. Perk of royalty. The bad news: we have no Kate Middleton for ya. The good news: her future cousins rock a hat. Indeed, I find myself wishing Princess Eugenie had kept the rest of it simpler to let the topper shine. Ditto Beatrice. Plenty of us commoners would love a chance — hell, a mandate — to wear a jaunty hat: for our sake, make it count. For a few minutes there, Sophie, Countess of Wessex got the Middleton treatment and her every thread was scrutinized. And I gotta say, the woman can wear a hat like no one else in the current extended family. A little 30s, a touch Tyrol, a lot of weird: royal perfection.